Hi my name is Mark St.Germain, I am in the Navy and was stationed in Fallon for 5 years. Yes Nevada has a Navy base. 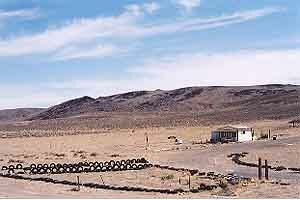 Being stationed there I have hit a lot of ghost towns and a lot of abandoned mines in the area. 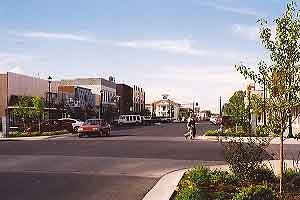 I love the Fallon area and plan on retiring there. I guess what I am saying is thanks for the news letter. This is a great way for me being on a ship to see Nevada. You won’t regret going to Fallon, and The Lahonton area. Don’t forget to visit Fort Churchill. Thanks again and I look forward to seeing Travelgram #2. Safe travels. Fallon is still a friendly, comfortable community. So persuasive was Mark’s message that Chris and I headed for Fallon to have some fun. My kids have always liked going to Fallon, because we always have a good time, and this was the weekend of the Hearts O’ Gold Cantaloupe Festival sponsored by the Fallon Chamber of Commerce. A few years ago Lake Lahontan had dwindled to a few damp spots barely visible in the distance, with boat launch ramps leading down to dry ground. This year, though the lake is its broad and sparkling self, with family groups dotting the beaches and boats cruising here and there. The lake was created at the turn of the 20th century as a part of America’s first federal reclamation project, impounding the waters of the Carson River that had previously dwindled out into the Carson Sink. 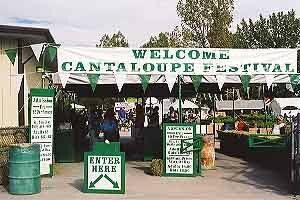 Welcome to the Cantaloupe Festival! This part of Nevada was once famous as the southwestern edge of the 40-mile desert, the deadly stretch of sand between the Humboldt Sink to the thin trickle of the Carson River at Ragtown. For years after the wagon trains along the Humboldt Trail were superseded by the railroad it was possible to pick up household items, even pieces of furniture abandoned by by the emigrants. Now there are beer cans and the occasional hubcap along the road and Ragtown (named for the laundry spread across the sagebrush to dry in the desert sun) is on Fallon’s western edge. Fallon was established as a crossroad store and post office in 1896, but irrigation brought prosperity and Fallon flourished, with turkey farms producing fine big birds and delectable Hearts O’ Gold cantaloupes shipping to fine restaurants around the nation in the 1920s and 1930s. The Naval Air Station established in 1942 has become Top Gun training school for fighter pilots and a major constituent of the local economy. As we drove into town jets were capering in the bright blue yonder to the east, and on that innocent day they seemed irrelevant to peaceful Fallon. 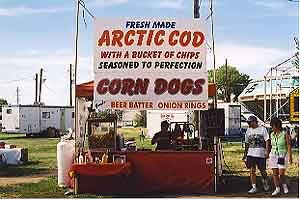 The Churchill County Fair Grounds are on the south side of town (take Taylor Street), and parking is plentiful and free. Admission was $5 for me and $3 for Chris. Inside the gate we found a small town carnival, with food booths and rides, a performance tent that featured a cowboy trick roping troupe and a stage hypnotist, an open air stage for music, and two booths near the exit selling melons: Workman Farms and Lattin Farms. Workman Farms is located at 4990 Reno Highway on Fallon’s west side. In addition to the full range of garden vegetables, they sell crafts materials and operate a well-stocked nursery. They also participate in the Farmers’ Markets in Reno, Sparks, Carson City and Fallon. Lattin Farms, at 1955 Mclean Road, has evolved from a family farm to a family recreation enterprise (more below). Mud Volleyball combines sun, heat, sporadic physical activity and cheap beer. Not for the weak. Lattin Farms in southwest Fallon is a rewarding destination. Our schedule didn’t let us linger late in Fallon, but as we meandered out of town i noticed what seem to be dozens of Mexican restaurants. I’ll pass along any suggestions readers may send about hidden treasures in Fallon dining. We expect to be back later in the fall because it’s such an enjoyable time to visit Lattin Farms. 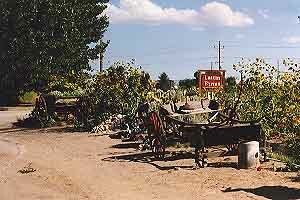 Lattin Farms is a wonderful autumn destination (Map) for any family with children, especially young ones. They create a giant maze in a cornfield for you to blunder through, they have a ‘critter walk’ with farm animals for the kids to inspect and interact with (and goats to feed), they have ‘Scarecrow Factory’ days where you can make a pumpkin-head scarecrow for $5. They sell farm-made foods, from jams and jellies to fresh baked pies, and on busy days you can get a burger or a hot dog. You’ll find the details on their website. No, it’s not the Governor’s Mansion, it’s a private residence on US 50 east of Silver Springs. I keep looking for a reason to stop in Silver Springs, but if it’s there we didn’t notice it on the way home via US 50. I can tell you that the last time I was in the Oasis Cafe at Stagecoach they had a very nice steak special well worth the drive from Dayton, maybe even Fernley. And speaking of Dayton, if you want to see a town in transition between the 19th century and the 21st, this is it. There are curbs and gutters now, subdivisions, an industrial park, golf course and airport. There’s a car wash, if you can believe it! There’s even a Smith’s! But the old downtown still dates back to the era of the Pony Express, much of it unpainted since Clint Eastwood came to town to make ‘Honky Tonk Man’ in 1982 and spruced things up for the movie. 30 years before that, Dayton was a trading post at the side of the wagon trail to California. Just a few nights ago I saw something in Reno that you should see too, if you can: a retrospective show of paintings by Roy Powers at the Nevada Historical Society on north Virginia Street at the northwest side of the UNR campus. Roy Powers was advertising manager of Harolds Club when I first knew him — who knew he could paint? Well, he can paint, and since the middle ’70s he has been making acrylic portraits of modest Reno landmarks (and some as far afield as Wabuska). Some of these neighborhood markets, cafes, schools and other structures are gone, some still thrive, but they are all portrayed in a style. combining precision and clarity, sunlight, affection and warmth. If you ever loved Reno, you’ll be glad you stopped in to see this show. The nine paintings in the entry hallway come down at the end of November, the main section (in the NHS Changing Gallery) will be up until December 29. Our Fallon Page (you can book a room).